Asbestos has been a known carcinogen for decades. It is a natural occurring mineral that that has been used for its non-flammable properties. Medical conditions occur such as asbestosis,mesothelioma and other cancers, decades after the initial exposure. Initially sold by companies in the 1920s, without warning of its known dangers, asbestos use continues not to be banned in the US. 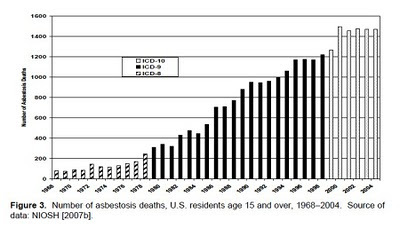 Disease from asbestos exposure is predicted to continue at very high rates. The largest transfer of economic wealth in the United States from Industry to the private sector, other than in the Attorney General’s thirty-eight State tobacco litigation, emanated from asbestos litigation which had its geneses in workers’ compensation. The late Irving Selikoff, MD’s pioneering efforts in providing expert testimony, based upon his sentinel studies of asbestos workers in Paterson, NJ, created the trigger mechanism for a massive wave of claims for occupational health care. The workers' compensation program never did adequately nor efficiently or expeditiously provide medical care. The workers’ compensation system did not provide an adequate remedy because of a constellation of reasons, and subsequently, the wave spread to civil litigation out of desperation for adequate benefits. Asbestos litigation has been named, "The Longest Running Tort” in American history. Asbestos litigation expanded into bankruptcy claims that continue unabated and the epidemic of disease continues. The remaining cases in the Federal court system were transferred to Federal Multi District Litigation (MDL 875) and the majority are finally concluding after twenty years of Panel consolidation. Large verdicts continue to be reported in asbestos claims. A Los Angles jury recently awarded $208.8 Million in what has been recognized as the largest asbestos verdict ($200 Million punitive damages) in the State of California. The case involved a household contact exposure to asbestos fiber. The wife of the asbestos worker was exposed to asbestos fiber on the clothes of her husband that he brought home and that she cleaned. Click here to read more about asbestos related disease and claims for benefits. For over 3 decades the Law Offices of Jon L. Gelman1.973.696.7900 jon@gelmans.com have been representing injured workers and their families who have suffered asbestos related illnesses.